Hello, everyone. Cheerful Harvest of Peace to all of our Shambhala friends, warriors, and citizens gathered throughout the world today. Harvest of Peace is one of our four seasonal holidays in Shambhala, known as Nyida Days, when we mark the changing of the seasons and our connection with the natural world around us. The Sakyong Wangmo is not able to offer the Harvest of Peace address this year due to some family circumstances. So it’s my honor to introduce our Sakyong and request him to offer a Harvest of Peace address to all of us today. A very cheerful Harvest of Peace, everybody. I am delighted to be addressing you on this very special day as we gather around the world, both in the Northern and Southern hemispheres. It’s traditionally a time of autumn for the Northern hemisphere, and in the Southern hemisphere, obviously it’s a different season. However, today is very much about us gathering as a community. The notion of Harvest of Peace is how we appreciate what we have. In the Shambhala calendar, it’s a time of renewal and reflection, a time when many of us are beginning school and there is a new season happening after an eventful summer. So it’s a time of transition. It’s also a time to reflect as a community about what we as Shambhala have, what we’ve worked hard to develop over the years in terms of our own personal practice and path, and now more than ever, a sense of community, clan, and family. I am delighted that over time we have included more families and children, and that this is very much a generational celebration for us. It is a time in the world when peace and the notion of community are very important. How can we maintain our own sense of integrity and wellbeing, and at the same time be open-minded and able to connect to and appreciate others, and also have compassion and a sense of understanding as the world is changing through many recent events—the weather, the climate, and various social issues that are challenging for many people? There is a lot of fear and instability. 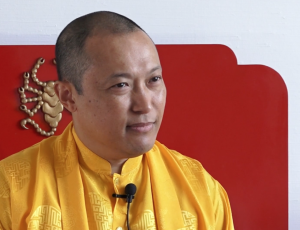 As Shambhala communities, one of the most important aspects is that we try to gather and support each other, re-dedicating ourselves by reconnecting to our own basic goodness, confidence, and warriorship—the twin virtues of gentleness and fearlessness. I feel that both these elements are very much needed. I encourage all of you to connect with each other at a very human level. We have the blessing and good fortune of having spiritual practices and community practices that deepen us to the core and allow us to look at reality in a very profound way. At the same time, reality, no matter how deep it is, is intricately connected with our own life and the society we live in right now. Part of this next period for us concerns how we can actually talk to each other and have a conversation, using these principles in communication—listening and talking. I know many of you are good at these, so it shouldn’t be too hard and it should be very natural, since we understand that one quality of our communication is that it is the expression of our own lungta, our life-force energy. This is a period when we are weaving the tapestry of our own principles, which can happen by having these simple but very meaningful gatherings, such as we are today. These seminal moments that mark our calendar and our progress throughout the year, and also throughout our life, are essential for re-grounding and connecting. It’s a time when all of our practices and vision need to be utilized and embodied. One quality that I encourage is the sense of hosting, the sense of warmth—that from our own sense of confidence and well-being we can be an actual beacon, a place for gathering and communicating, especially now, when it’s hard to acknowledge simple human principles of goodness, decency, love, and the expression of kindness and friendship. These are themes that never get old. They are essential to anybody’s well-being, and especially to the well-being of the community. Today is an opportunity for us to look at each other, to share food and drink, to be able to converse, to be able to spend a simple time together. This is how the fabric of our community is built. There is a sense of enjoyment. There is a sense of releasing the burdens of life and being able to actually care and have affection. I encourage everyone to spend this time together. This is an important time for Shambhala: we are actually manifesting many of the principles that we have so long held dear. But it is a time when these principles seem to be more and more needed in the world. I invite all of you to take these principles into your own life as your vocation, to draw inspiration from them and to actually take that energy out, so that there is a real sense of the sun shining and the brilliance of what is happening. In these seemingly dark or difficult times, we have the opportunity and ability to actually look up and extend out. Whether that is just for a few moments, or whether it is a shift in terms of how we perceive the world, I definitely encourage you to connect to your inherent brilliance and strength and to shine. It does not have to be dramatic. It can be very simple to realize that we have this huge reservoir of goodness, power, and potency. So I leave you with those thoughts and words. I know it’s a day when many of you will be celebrating at different times, and with community time as well as family time. I think it’s wonderful. I hope to see you somewhere very soon. I am sending my love and blessings to all of you on this very wonderful day. Thank you, and again, a cheerful Harvest of Peace.